​On September 16 2016 an enthusiastic group of Society members gathered at the foot of Hall Street in Nelson for Otsukimi- お月見 - ​Moon viewing on the occasion of the full moon. Initially there was a cloud bank that obscured the moon, but later the clouds thinned out and gave way to the spectacular harvest moon. 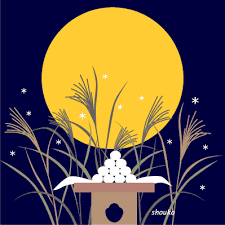 ​Shoko Armstrong explained that, in Japan, Otsukimi coincides with the harvest season, and people gather around a display of autumnal flowers, fruit and rice cakes called dango. The moon is admired and members of the group read haiku, Japanese poems arranged in three lines containing five, seven and five syllables. Though the origins of haiku date back to 1200 years before the present, the form was taken to a higher level in the 17th century by Matsuo Basho and remains popular to this day. Meigetsu o "I want the harvest moon"